- A profit in cutting speeds. - In less cuts to the final result. - The spark gap can be controlled up to 500x / second through the interaction between the Smart generator the Smart controller and the Smart-Line drive. The new EDM machines are installed and ready to give customers the best possible service. In 2017 Fijn Mekaniek Nelissen realized an expansion of the production hall and the warehouse. In addition to the existing production hall an identical production hall was built which corresponds to an extension of 1000m². In addition to the new production hall a warehouse of 600m² was also built. Fijn Mekaniek Nelissen will now be even more flexible in customerservice. New machines and new employees are now the next challenge. The VERTICAL TRAVELING COLUMN (VTC) 800/30 SR Vertical Machining Center features a high speed full 5-axis simultaneous machine with 40 Taper spindle swivel spindle head (B Axis) full traveling column design and fixed table for machining of extremely long and heavy workpieces. With the table partition the long machine table can be transformed into two separate work areas. The machine has improved accuracy and repeatability which allows the machining of complex features and contours. The Mahrshaft SCOPE Plus is a flexible 100% automatic measuring device. The optical measurement is performed during a rotational movement of the workpiece to be measured. The measuring machine also comes with the option to measure tactile (with a probe). For all measured workpieces a measurement report will be drawn up which will be made available at the customer's request. The measurements are carried out fully automatically and are not influenced by the operator of the machine. The Mahrshaft SCOPE Plus offers the possibility to measure details that can not be measured in a different way. Tolerance fields are adjustable / concentricity / bevels / angle determination in conical pieces / thread metering. 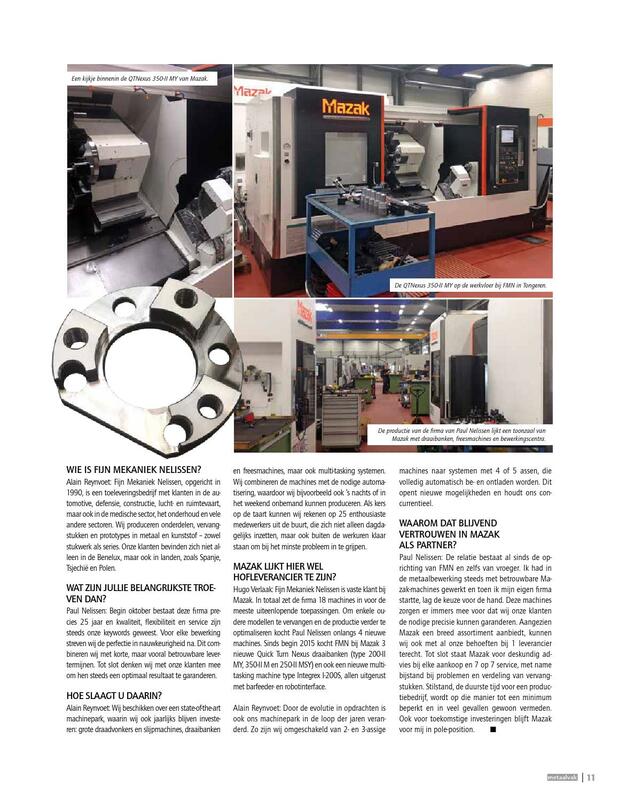 On December the 30 of 2015 Fijn Mekaniek Nelissen appeared in 'Made in Limburg. Paul Nelissen and his daughter Evi talk about the still growing business and operation of the company. Daughter Evi can not wait to take over the still growing company soon. By clicking the link below you immediately go to the article. For a very clear indication of our work at Fijn Mekaniek Nelissen please refer to the following article. This article appeared recently in "metaal Vak3-2015. In the first quarter of 2015 we bought some new machines. So there were four older machines from our workshop removed and sold. As a result we had created enough space to integrate brand new high-quality machines in our workshop. 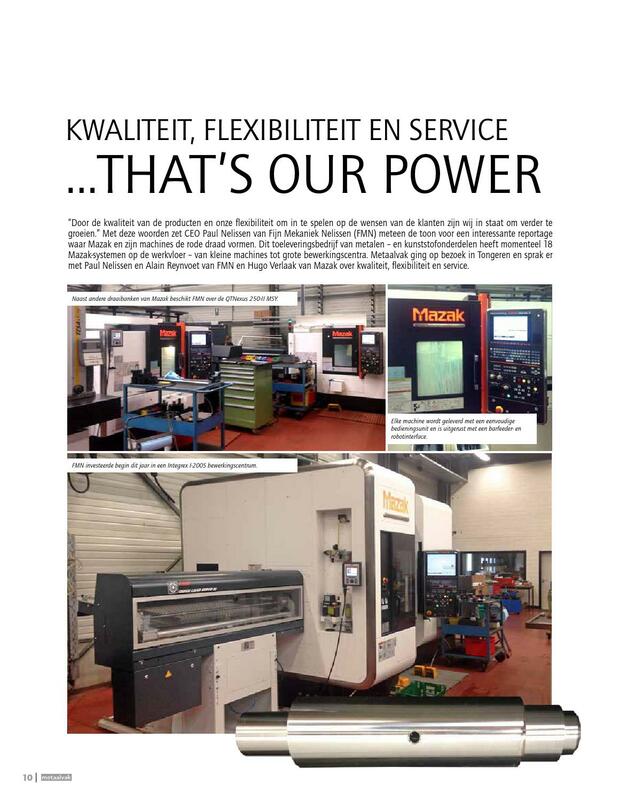 In January there were already four (4) new Mazak machines purchased. These machines are already in place and are now producing more accurate and faster parts. With these more accurate and faster machines we can meet the expectations of our customers. These machines are a lot faster that way we improve our flexibility and our delivery times. From the month of February on we started working in a two-shift system. Our business model is still based on the work of a one day shift-system. In the context of flexibility we want to work in 2 shifts that way we can be more flexible for urgent deliveries. So you see flexibility is very important in this context. that way we want to provide the best service for our customers. Visitors of our webpage probably noticed the changes. We want to point out more our strengths on the website. The 3 most important pillars of this company will be presented on the new website: FLEXIBILITY QUALITY and SERVICE. Since the beginning of 2015 we hired ten (10) new employees. These employees are young people who left school last year or the previous year. We will give them a proper training and this will ensure the future of our company. At Fijn Mekaniek Nelissen we invest in our own future staff. We train them to become the craftsmen who will be your future partner. At Fijn Mekaniek Nelissen we did on our existing CNC machines a laser alignment. We’re convinced that this investment in our machines is beneficial for our customers. Leveling of the machine under laser control increases the repeatability of the machines. A better repeatability ensures a better accuracy of the finished products. Similar to the accuracy of new machines. The better positioning accuracy will improve the precision and therefore also the quality of the finished products. This investment gives you as a customer of Fijn Mekaniek Nelissen certainly an advantage.